Welcome to F4WOnline.com's live coverage of UFC On ESPN 1: Ngannou vs. Velasquez, which is taking place at the Talking Stick Resort Arena in Phoenix, Arizona. The Octagon heads back to Phoenix for the first time in just over two years for their first full main card airing on ESPN headlined by a heavyweight knockout artist welcoming a former UFC champion back to action. 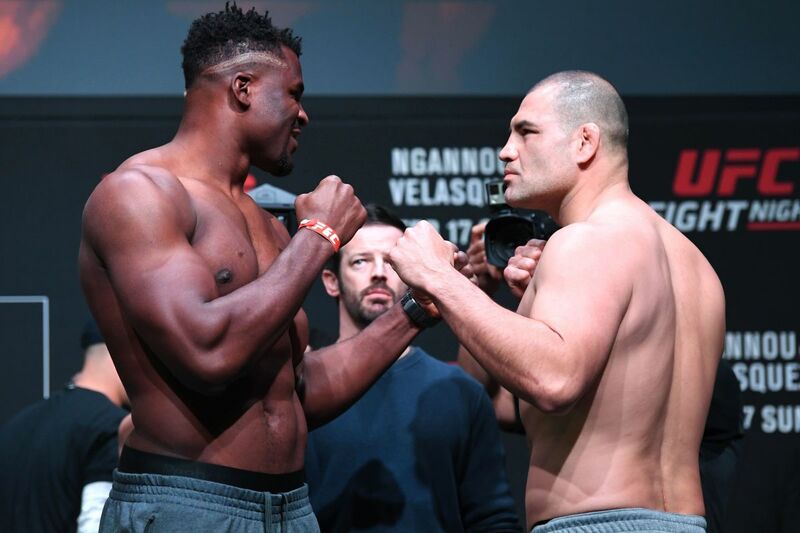 Heavyweight power house Francis Ngannou goes for his second straight win as he takes on former two-time UFC Heavyweight Champion Cain Velasquez in the five-round main event. Ngannou is coming off a 45-second win over Curtis Blaydes in November. Velasquez fights for the first time since UFC 200 in July 2016, as injuries and contract talks have delayed his return, but arguably the greatest UFC heavyweight of all-time is looking to get back to action and a title shot with an impressive win. In the co-main event, it will be a lightweight battle between action fighters as James Vick takes on Paul Felder. Also on the main card is a women's strawweight bout between Cortney Casey and Cynthia Calvillo, as well as a featherweight bout pitting Alex Caceres against the UFC debut of Kron Gracie. Prelims will air on ESPN, as well as ESPN+, capped off by a pivotal bantamweight bout between Jimmie Rivera and Aljamain Sterling. Follow along with our live coverage of the event beginning at 6 p.m. Eastern time with preliminary action all the way through the main card. Whitmire gets a takedown 10 seconds in. She's the much larger fighter as she used to fight at bantamweight. Albu briefly up. Whitemire takes her back and secures a rear naked choke and gets the quick tap. That was the fastest submission in UFC strawweight history. She was so happy in her post-fight promo. She talked about how much she loved Phoenix. She plans to keep training hard and hopes to fight again soon. Nice punch exchange 30 seconds in with Sanders landing the hardest one. Barao still throwing a variety of kicks. Sanders lands a nice punch combo that rocks Barao and then an elbow to the head. Sanders knocks Barao down and finishes him with punches. Barao was out cold when he hit the canvas. Sanders said it's been a tough camp and he almost didn't make it to the fight. He put over Barao as a legend of the sport. Holtzman's corner told him he lost both rounds and needs a finish. It's probably better to say that when you've got a close round and he might be right. Holtzman advancing to start and hurts Lentz with some punches to the head. Lentz firing back with punches as well. Holtzman blocks a takedown attempt. Lentz with a punch/kick combo. Holtzman landing hard punches but not even phasing Lentz. Lentz takes the back standing but Holtzman manages to break free. Lentz takes the back and drags Holtzman to the canvas. Hotlzman up but Lentz still controlling his body. Lentz 7/15 on takedown attempts now. Holtzman with elbows to the head as Lentz is working for the takedown. Elbows are doing damage and Lentz is barely holding on. Holtzman advancing and Lentz' face is a bloddy mess. Holtzman landing hard punches standing and then a flying knee. Lentz with another takedown but Holtzman right up. Lentz controlling the body. 10-9 Holtzman, 29-28 but last two rounds were really tough to score. Crowd booed the decision. Lentz said he's a tough opponent and probably a top 5 guy. Bermudez gets an early takedown and working for a rear naked choke but Lopez works him back to guard. Bermudez landing hard punches to the head and body. Lopez to his feet but Bermudez still controlling his body. Lopez takes control of the clinch. Bermudez with a couple of attempts at a standing guillotine. He uses that to drag Lopez to the ground. Bermudez secures a D'Arce choke and gets a quick tap. Bermudez wants to fight another unbeaten bantamweight next and brought up the names of Brad Katona and Shawn O'Malley. Either fight would be good and I could easily see them booking him against Katona. Sterling asked for a rematch with Marlon Moraes, saying he got lucky the first time they fought. He thinks they should be fighting for the next title shot. Fili said he loves the sport but doesn't get paid enough, which surprisingly draws some boos. Says he'll be a future world champion. Both trade leg kicks early. Great punch exchange with both guys landing hard shots. Head kick from Luque backs up Barberena. Knee to the body followed by punches from Barberena. Signfiicant strikes landed are 97-95 for Luque. Both guys land hard shots to the head and get rocked. In 40 combined fights, neither has ever been knocked out, which explains a lot. Barberena turning up the pace at 2;00 and lands a ton of unanswered shots. Luque starts to block some of them and then firing back with elbows and punches to the head. Knee to the body from Barberena. Series of elbows to the head from Luque and Barberena fires back with punches. Barberena has a 37-28 advantage in head strikes landed this round with 90 seconds left. Luque with a punch/kick combo and Barberena briefly down but Luque lets him up. Both guys firing bombs with 30 seconds left and the crowd is going nuts. Luque landing hard shots. Barberena down and collapses and the ref stops it. This was one of the best fights you will EVER see and worth going out of your way to see. They embrace before the post-fight interview and both are going to get to speak. Luque says he's getting married next month and his face won't look too good. Luque says he's a top ten fighter and just proved it. His 8 wins by finish are tied for 4th most in welterweight history. He may have needed the finish to get the win in a close fight and he pulled it out. Barberena got a standing ovation from the crowd. He put over Luque as a warrior. He says he'll keep improving, get better and bounce back. Gracie lands the first strike of the fight that backs up Caceres, a punch. Gracie takes the back standing. Gracie drags him to the mat, while still in back control. Gracie with a body lock and working for the rear naked choke. Gracie secures the choke. Caceres fights it for longer than he probably should've and taps as he was about to pass out. Gracie started his promo by saying "Whoomp, there it is". Crowd didn't quite know how to take that. He says he'd like to fight again as soon as possible. Nick Diaz was shown in his corner but not identified. He swore and the audio was cut out and he apologized for it. Crowd boos the decision despite the fact that Calvillo and Casey embraced afterward. Boos get louder during her promo even though she was putting over her opponent by saying how tough the fight was. They just didn't care about her unfortunately. Says she wishes she'd have performed better and asked for a top 5 fighter next. Brought up the name Tatiana Suarez, which drew more boos. Then she spoke in Spansh and they cheered. Weird. Felder said that UFC is in his hometown of Philadelphia and he won't be ready to fight but he'll be working the show and he wants Justin Gaethje, win or lose, for his next fight. Good callout. Cain is the massive crowd favorite here, returning after almost 3 years away and N'Gannou is booed as heavily as Cain is cheered. For the first time I can recall, at least pre-fight, Cain looks old. Cain bouncing around a lot early and throwing kicks. N'Gannou lands hard punches and knocks Cain down. Cain twisted his knee on the way down and N'Gannou finished him with punches. Ngannou dedicated the fight to his aunt, who just passed away. He promised the fans that he's back. Says he's honored that Cain accepted the fight. Jon Anik called Cain a future Hall of Famer and Cain asked the fans to give it up for Francis and they gave him a nice ovation. He says he let himself get to close and paid the price. He says he'll fight again as soon as he feels good again. He apologized to the fans and they gave him an ovation anyway.